In Japan, entering a horse to race under the influence of drugs which temporarily stimulate or depress race performances is prohibited strictly by Horse Racing Law. Also, the usage of certain drugs is restricted from the standpoint of horse welfare and injury prevention (hereinafter referred to as restricted drugs) by the JRA. Besides those prescribed in these regulations, all matters concerning the control of drug administration to racehorses shall be prescribed by the JRA Veterinary Officer. Please check with the JRA beforehand when considering any drug administration to horses scheduled to race in JRA races. 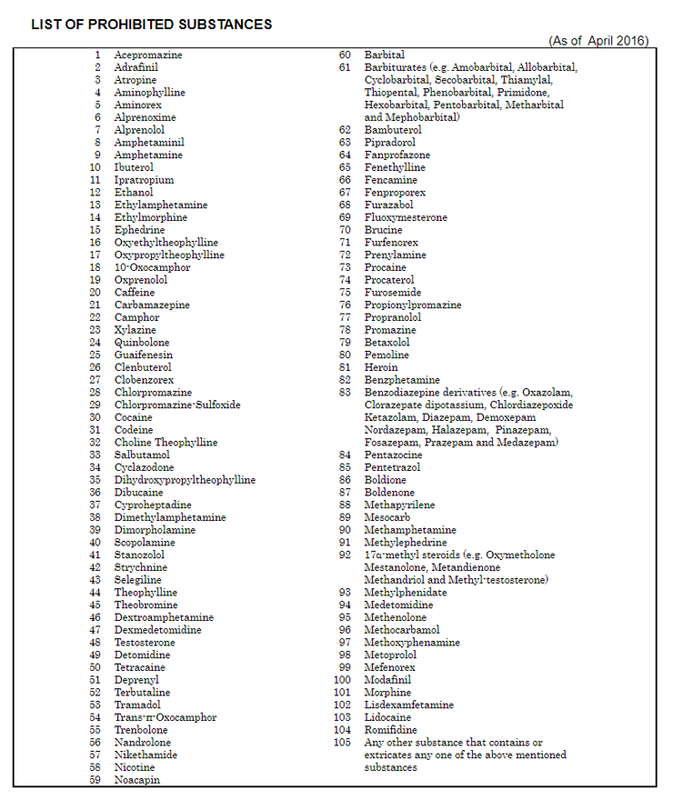 a)Prohibited drugs (listed on the following page) are defined as "substances which temporarily stimulate or depress race performance". In the event the prohibited drugs (except for anabolic steroids) are administered to a horse, the horse concerned cannot race for a period of 10 days. However, if the prohibited drugs such as Detomidine (49) and Medetomidine (94) are administered, the horse concerned cannot race for a period of 5 days. In addition, please be aware that Lasix (75 Furosemide) is also listed on the following page as prohibited drugs and substances. b)The use of anabolic steroids is not permitted. c)The use of any unlisted substances with the purpose of, or lead to temporarily stimulating or depressing race performance is prohibited. Please refer to Article 31 of the Horse Racing Law and Paragraphs 132-136 of the JRA Rules of Racing. a)Horses must not race under the influence of restricted drugs (listed below), which are defined as "drugs to be restricted from the standpoint of horse welfare and injury prevention". b)The JRA will recommend withdrawal times for such restricted drugs. Please contact the respective JRA Representative Offices for specific information. Please refer to Article7,12, and Separate Table (2) of the Matters to be Instructed by Veterinary Officers. Please submit horse medication record to the respective JRA Representative Office, using the supplied official form, no less than three (3) days prior to the horse departure for Japan, including all medications administered to the horse within two weeks prior to the departure date. Upon arrival to Japan, please submit any update of any medication administered after submission of the first medication record. a)No treatment can be given to a horse from the day before the race. b)Prior consultation with the veterinary officer is necessary in case a drug or medication is to be administered to a horse scheduled to run. c)No one except the veterinary officers of the JRA can diagnose or give treatment to the horse. a)Medication and Pharmaceutical Products brought into Japan by persons involved with scheduled runners can not be used at JRA premises. Therefore, any such products will be kept in the JRA's custody until after the race. b)b)	A variety of products such as hot and cold compress medications (poultice), shampoo, skin protection cream, hoof oil and other products for the horse's care will be provided by the JRA. A list of these supplies is available at each JRA Representative Office. The trainer cannot use their carried-in products. Pre-race testing will be conducted twice. The first pre-race testing will be held upon arrival in Japan and the second testing will be five (5) days prior to the raceday. Both blood and urine samples will be taken for analysis for the first pre-race testing, and for the second pre-race testing, only urine sample will be taken. However, should any prohibited and/or restricted substances or drugs be detected, the JRA reserves the right to conduct additional testing. The horse will be withdrawn from the race if the final sample reported positive to any prohibited substances. Further, even if the pre-race testing reported negative to any prohibited substances, this does not ensure that the horse will be reported negative in the post-race testing. Physico-chemical tests are conducted on horses that finish first through third in the race, and any horse designated by the stewards of the meeting, under the Rules of Racing of the JRA. The horses concerned must submit urine or/and blood sample after the race. The collected samples will be divided into two samples, and Physico-chemical test will be conducted at the Laboratory of Racing Chemistry, on sample A. Should the existence of a prohibited drug or medication be detected, sample B will then be tested automatically at the same Laboratory, in the presence of the non-partisan designated witnesses, who have knowledge of the field of Physico-chemical testing. No notice will be given to the connections of the horse at this time. No person other than these witnesses can be present at the retest procedure. If the presence of the same prohibited drugs or medication is detected in both samples A and B, it will be considered as a violation of the drug and medical regulations. The horse concerned will be disqualified and suspended from running in a race for a fixed period. The connections of the horse will not be entitled to receive any prizes, or prize money. The horse connections concerned may be charged under Article 31 of the Horse Racing Law and will be penalized in accordance to Paragraphs 123, 131, 138, and 140 of the JRA Rules of Racing.